One year ago, prisoners throughout California’s vast prison system initiated a second wave of hunger strikes, doubling the participation of the first, historic strike several months earlier. 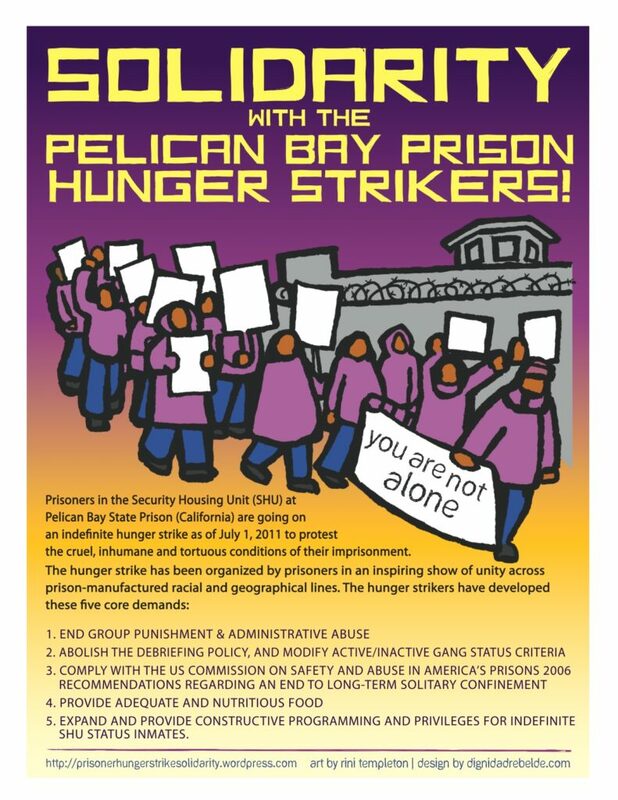 12,000 people in over a third of California’s 33 prisons refused food in solidarity with their fellow prisoners’ calls from California’s notorious Security Housing (SHU) and Administrative Segregation (Ad-Seg) Units, demanding an end to the torturous conditions they had endured for years. Together the strikes inspired unity across different geographic and social barriers among prisoners; called attention to peoples’ living conditions at all levels of the prison system; highlighted the political nature of imprisonment from attacks on organizers to the war on gangs; shone a light on the inspiring struggles led by prisoners’ loved ones; and, perhaps most importantly, reminded us that prisoner organizing and resistance are alive and growing. While California’s prison administration has been lax in addressing the strikers’ demands, the strikers’ heroic actions have created the conditions for profound changes to the prison system. Since last year’s strikes, prisoners have worked with lawyers to file a landmark lawsuit that has the potential to shut down Security Housing Units altogether. Through supporting their loved ones, family members of SHU prisoners have gone on to found organizations such as California Families to Abolish Solitary Confinement, that have in turn joined with allies to win gains against other parts of the system, including the imminent repeal of the draconian media ban. Groups working to support the hunger strike have strengthened their ties to one another and to other organizations and activists from across the globe, supporting prisoner struggles in other parts of the US, in Palestine, and Colombia. News outlets from around the world have slowly but surely been pushed to relate to people in prison as human beings. We are not beasts and we do not intend to be beaten or driven as such…. What has happened here is but the sound before the fury of those who are oppressed… We have set forth demands that will bring closer to reality the demise these prison institutions that serve no useful purpose to the people of America but to those who would enslave and exploit the people of America. Critical Resistance honors the legacies of prisoner resistance and organizing and we are proud to continue to support California hunger strikers through the Prison Hunger Strike Solidarity Coalition. We are continuously inspired by the “sound before the fury” coming from prisoners throughout world—a sound rich with creativity, courage, and hope.